Originally written for Valkyrian Music. I’ve always had a WTF feeling whenever hearing something new from Dead By April, ever since the very first time I’ve listened to “Losing You” back in late 2008/early 2009. But then the songs would find their way through my ears and stick around, to the point where I would admit I liked them. Not this time. Actually, not since “Mystery”, the song they’ve tried taking to Eurovision Song Contest 2012. “Let The World Know” is out for over a month now, I’ve listened to it several times, and the WTF feeling still lingers, meaning that, to me, this isn’t a good album. I should have guessed since I didn’t have any reaction, good or bad, to the first songs released to the public (“Freeze Frame”, “Empathy” and “As A Butterfly”). They sounded too average and nothing that they haven’t done before. As a friend of mine said, “DBA is a band that covers itself”. And when “As A Butterfly” ends up being one of the best songs in the album after all, along with “Beautiful Nightmare”, that’s pretty bad. When I reviewed “Incomparable”, I said that they had stretched the term “pop metal” to its limits, the pop being poppier and the heavy being heavier. The problem with “Let The World Know” is that the pop embraced its dance variety and the heavy is like a ghost – translucent and unnatural. Take “Done With Broken Hearts”, for instance. When Stoffe starts screaming is so abrupt, so out of place, that it feels like it’s just an excuse for them to keep using the word “metal” and not how the song really should have turned out (by the way, peeps, harsh/growling vocals isn’t enough to brand something as metal). And “Abnormal” will make you feel like you’ve just stepped into a rave party! Pop metal, okay, that’s actually interesting. Pop dance metal, now that’s way out of line. I won’t give up on them just yet, but “Let The World Know” won’t be part of any playlist of mine. 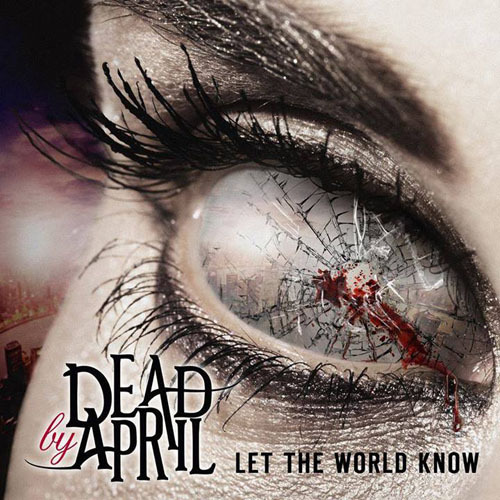 This entry was posted in CD reviews and tagged DBA, Dead By April, Jacob Hellner, let the world know, pop metal, Spinefarm Records, Universal Music. Bookmark the permalink.